The growing 55-and-over population has a lot of pain points that weren’t being relieved by products on the market. Bresslergroup and Jacuzzi filled the void for an affordable, simple, safe, easy-to-install aging-in-place shower solution. The lack of options for good aging-in-place products presented both a business opportunity and a chance at improving the human experience. As the 55 and older population continues to grow, the marketplace will demand more, better aging-in-place solutions. After testing the water with a walk-in bathtub, Jacuzzi wanted to further exploit its core hydrotherapy competency by designing a shower. Competing products are either low-cost and institutional-looking, or priced out of reach for most users. Part of what makes the Jacuzzi Hydrotherapy Shower persuasive is its adaptability to users’ needs over time and its ease of installation into the standard 60” x 30” bathtub footprint found in many American homes. 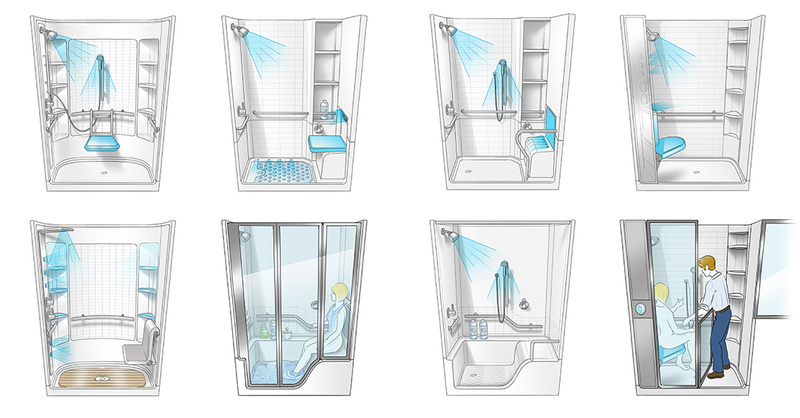 Bresslergroup researched the ADA recommendations for shower enclosure design and the recommendations of NC State University’s Center for Universal Design. Both sets had to be adapted to the smaller 60″ x 30″ footprint. The structural implications of grab bars that would satisfy ADA weight recommendations and support the moveable shower seat had to be considered in detail, too. 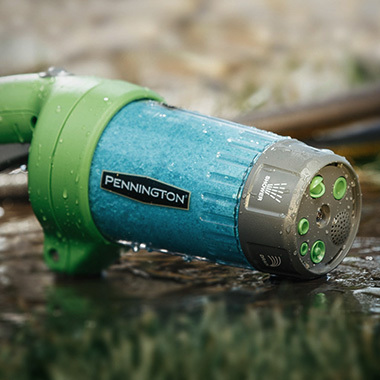 Further investigation regarding common pain areas for over 55 year olds (arthritis, neuropathy, sciatica, inflammation, and restless leg syndrome) guided the positioning of the water jets. Our team talked to installers and looked at competitive products to determine how one might easily and inexpensively remove a bathtub along with its plumbing and tiling and replace it with a new shower enclosure. Custom solutions are expensive to install, as are threshold-free ADA-compliant shower enclosures, which require lowering the drain or raising the floor. Jacuzzi Hydrotherapy is a low-threshold shower that is not fully ADA compliant but offers many of the ergonomic and safety advantages at a significantly lower product cost and installation cost. 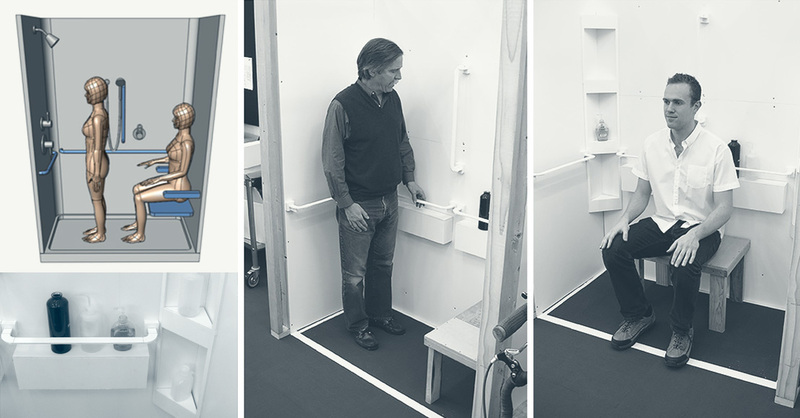 Bresslergroup relied on ergonomic assessment software and testing with full-sized mock-ups in plywood and foam-core to develop an enclosure with the best combination of storage and sitting space, plus water controls and grab bars that are easy to reach. Testing with users was qualitative and small-scale but provided valuable feedback for fine-tuning the design. Later in the shower’s development, Bresslergroup participated in an experiential test of the shower’s digital model with the virtual reality team at Boeing Defense, Space & Security. The split screens, pictured below, show the actions of the user and the resulting different viewing perspectives of the virtual model. This design evaluation allowed us to virtually scale the same user and simulate the interaction experience of different-sized ergonomic percentiles. 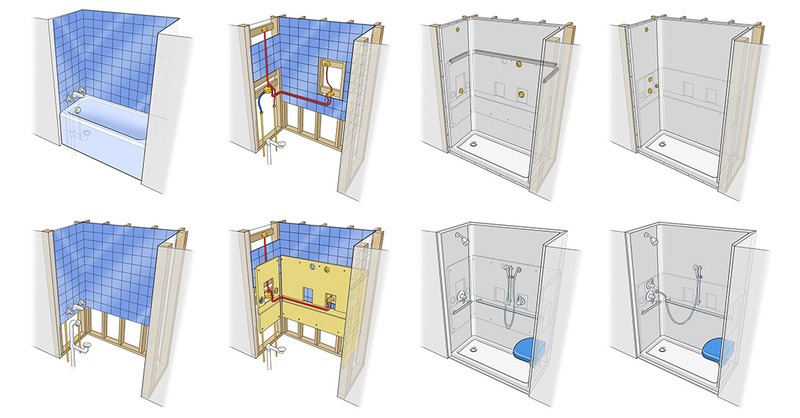 Controls and features like the shower head could be moved in real time to assess different location options. 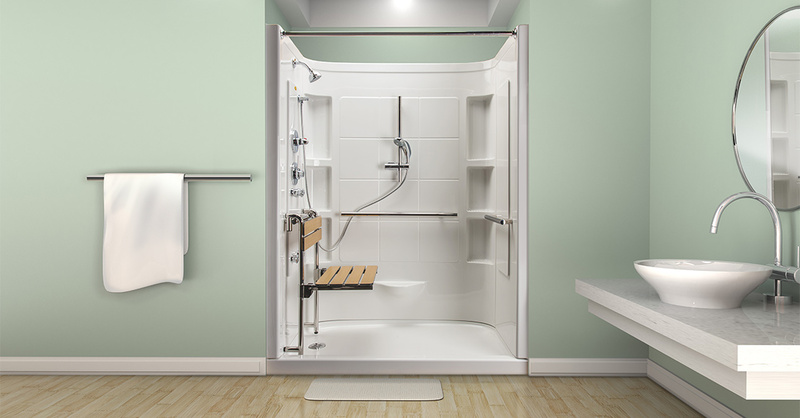 The seat, grab bars, showering mechanisms, foot rest, and storage features are designed for ease of use and ergonomic correctness based on ADA recommendations for shower enclosure design, ANSI Standards for Accessible and Usable Buildings and Facilities, and the recommendations of NC State University’s Center for Universal Design. 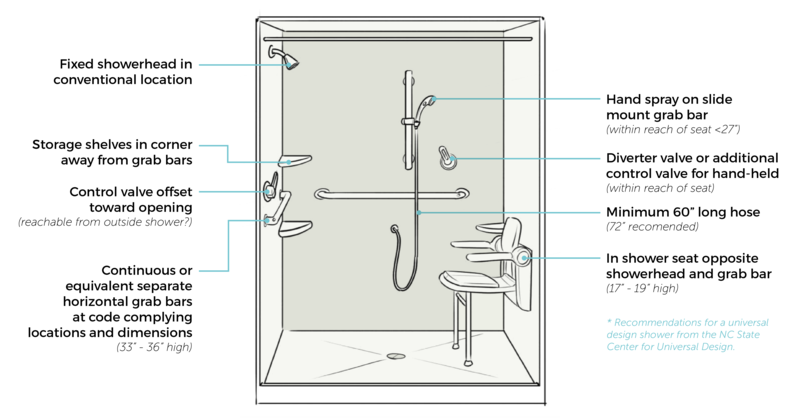 The Hydrotherapy Shower was honored with an IDEA Bronze in IDSA’s annual competition. Malleable features adjust for differently abled users and their evolving needs. Four massaging, adjustable jets showcase Jacuzzi’s core strength and are specially designed to relieve the 55-and-over set’s most common pain points. The moveable seat allows caregivers to place themselves outside of wet areas while providing assistance. And the seat is easily removed altogether for a houseguest or to create more space. The shower’s pure, simple visual design is an enduring style that is meant to fit into both contemporary and traditional households. A continuous curved wall sweeps around the back, lending a softness and spaciousness to the design and creating generous corner storage areas. Grab bars wrap around the perimeter as much as possible. They, along with a foot rest and seat, are integrated into the overall design and laid out symmetrically so the entire product appears clean, intentional, and intuitive. Like what you see? Drop us a line. 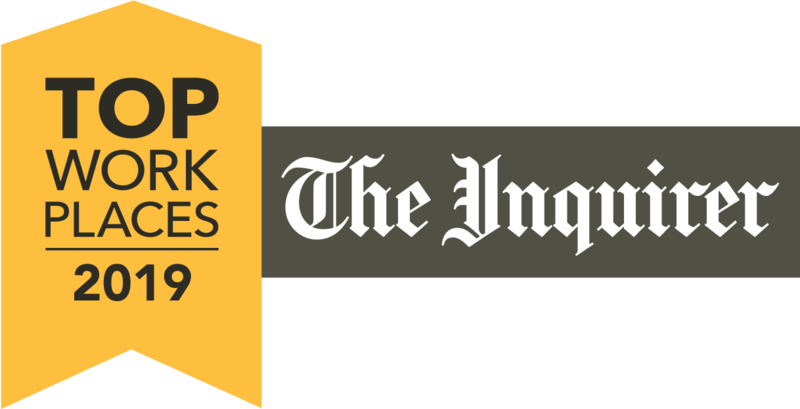 We're an insight-driven product development firm. 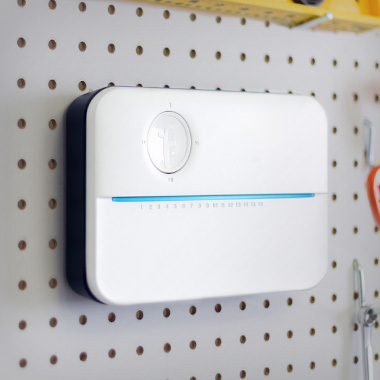 Curious About Product Innovation? Sign up for our newsletter. 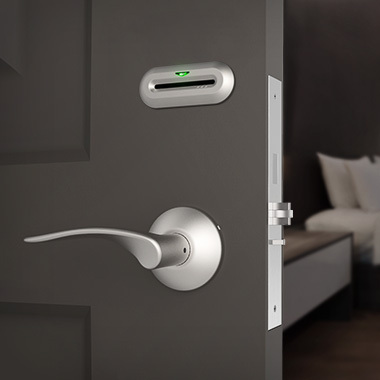 Change the way you think about product design... Watch our video series.